I just thought I’d take a moment to share two pictures I snapped along Princes Street today. The sun is still shining, and we have reached a whopping 43-degree high!! 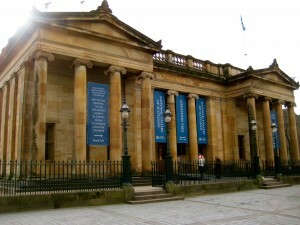 This is the National Gallery of Scotland, where I have most of my Art History tutorials. It is such an amazing opportunity to be able to study some great artists (we discussed the Renaissance’s Titian today) while standing in front of their real life paintings! There is almost always a bagpiper on this corner (Princes Street & Waverly Bridge), but I finally had my camera on me to take a picture! 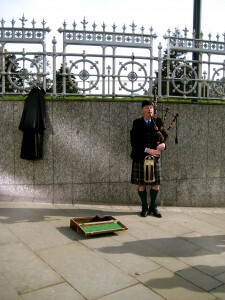 This entry was posted in Alayna Schoblaske '10, Scotland and tagged bagpipes, kilt, National Gallery of Scotland. Bookmark the permalink.